Set a shoe limit. Determine how many pairs of shoes will fit in the closet without getting jumbled. For us, it is 3 pairs of shoes per family member. Then ask each member of the family to pick out the pairs that they wear the most often and line them up in the closet. The rest of the shoes must be taken to their closet. Now is a good time to sort coats. Fall Consignment sales are approaching, and sorting those coats now will give you a head’s up to keep an eye out for specific sizes. Keep aside any outgrown coats or jackets for the next kiddo or for the Give-A-Kid-A-Coat campaign that usually starts in November. I also keep extra hangers for the laundry in the coat closet. Our top shelf has been a catch-all for reusable shopping bags, hats, scarves, umbrellas, tissues, lunchboxes, and anything else we didn’t know where to put but needed easy access. However, if I reached for one item, it seemed as if five would fall on my head. I solved this problem by creating every member of the family their own bin. On the outside of each bin, I put a vinyl chalkboard label with each person’s name. Now, items are only allowed to go in the bin of the person to whom it belongs and not just flung on the shelf. The best part? I made the cute bins for FREE from diaper boxes and fabric from my stash. I used the great box covering tutorial from Positively Splendid and the Basket Liner Tutorial from Make It-Love It. The only thing I altered for the basket liner is I did not create a casing or tie. I made my liners snug enough to fit firmly over the box without a tie. 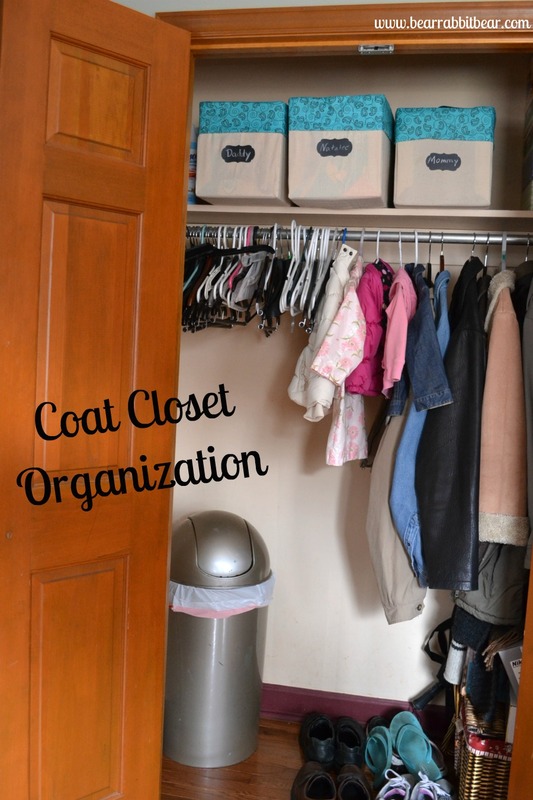 What are the tips that you use to keep your coat closet organized? Great ideas! My best tip is to go online and get tips from my creative blogger buddies! 🙂 I like the idea of three pr. of shoes per family member, especially – and those boxes. Good tips! I just did ours this pastnJanuary, and its actually still pretty organized! My favorite thing about it is the over the door organizer I use for hats gloves, etc. Very nice. I’m all about keeping it organized. Now I just need a coat closet- can you believe they built this house without one? Drives me crazy. Very inspiring! I can only wish I were that organized. I just found you through Days of Chalk and Chocolate and I’m your newest follower. I’d love it if you’d follow me back at http://www.crazythriftycrafts.blogspot.com. It must be contagious or just that time of year but I have been doing this too. 😀 Thanks for sharing. I really like the bins for each person. So organized. love this…and should probably implement it too! 🙂 thanks for linking up!